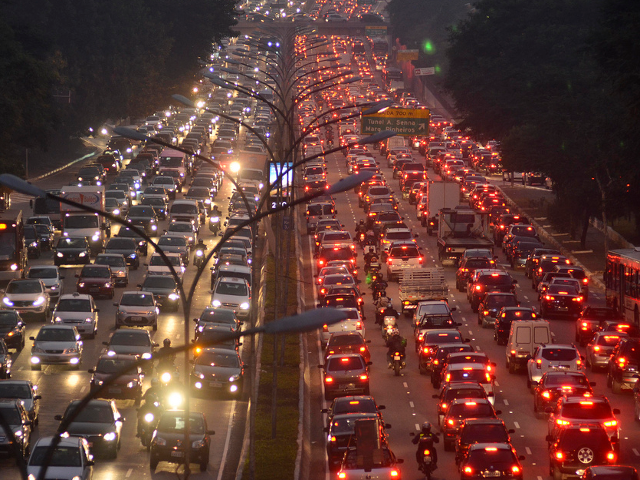 In Sao Paulo, increasing car sales led to the worst congestion in the city’s history. Photo by Levi Bianco. In May, car sales in Europe fell to the lowest level in almost two decades. Within the first five months of this year, car sales across Europe declined by 6.8% from last year’s sales. Germany, France and Italy, which together account for almost half of all sales in the region, decreased by an even larger percentage: 11.9% in France, 11.3% in Italy, and 8.8% in Germany. The downward slide of automobile sales in Europe has caused automakers and car dealers to worry as they slash prices and offer extreme discounts in an attempt to boost sales. Europe’s shift away from the car is not mirrored in Brazil, where car sales are at an all-time high. While car makers in Brazil may be celebrating, many Brazilians are concerned about the implications of the boost for urban mobility and traffic management. According to the National Traffic Department of Brazil (Denatran) the number of cars in major cities increased by 50% over the past ten years. In state capitals like Brasilia and Manaus, the percentage is even higher – a 90% increase in Brasilia, the Federal Capital and 138% in Manaus, the capital of Amazonas. Without a doubt, car sales in Brazil have reached historic levels. With lower interest rates and a reduction of the IPI (Excise Tax), Brazilians are encouraged to buy more cars than ever. In the first four months of 2013, Brazilians bought over 1 million cars. The country is now home to over 77 million cars. Though the number of cars per capita remains lower than many other countries, including most European countries, the impact of Brazil’s car boom is clear. In June 2012, São Paulo residents experienced the worst congestion in the history of the city, with 292 km (181 miles) of cars stuck in traffic. As the traffic situation worsens across the country, prioritization of public transport and non-motorized modes has become an urgent need. Investment in public transport, like advanced bus systems and cycling lanes, must occur in tandem with the development of better infrastructure for those who drive. The challenge for Brazil’s cities will be to meet the needs of a growing population and a growing number of cars, while guiding its citizens towards more sustainable methods of transport. This post was originally published on TheCityFixBrasil in Portuguese. To read the original article, click here.